I thought it was about time to try my hand at WebVR. I’ve played with regular old VR before, but for the fun short experiences I like to make, WebVR seemed like a better option because IT’S ON THE INTERNET. You can share it with a link and view it in a browser so you don’t have to jump through the hoops of downloading and installing apps to your computer or phone. VRTogether, a 2 month long virtual hackathon was running and it seemed like the perfect time to get started, I hadn’t been to a hackathon in a few weeks so I was in the mood to build something new, that and I had recently joined the Samsung Internet developer advocacy team and I wanted to work more with the web. A-Frame was my framework of choice. The docs are pretty good, it is feature-full and it has a visual inspector you can open up to debug and move things about. The visual inspector reminded me of Unity, a game engine I am comfortable using. I started by going through the examples on A-Frames site. I skimmed through their code, I made sense of most of it. There are entities which can have parent-child relationships, but I couldn’t get my head around how the scripts work. I went through a few tutorials which helped figure it out, such as A-Frame-school. I played about with each of the feature I learnt and thought about how I could combine them to make something fun that fits with the hackathon theme, “togetherness”, and would work well as a VR experience. I thought of simple game where you chase around animals until they run into each other. That simple idea actually wasn’t simple enough so I took out the parts with animals and moving the player. 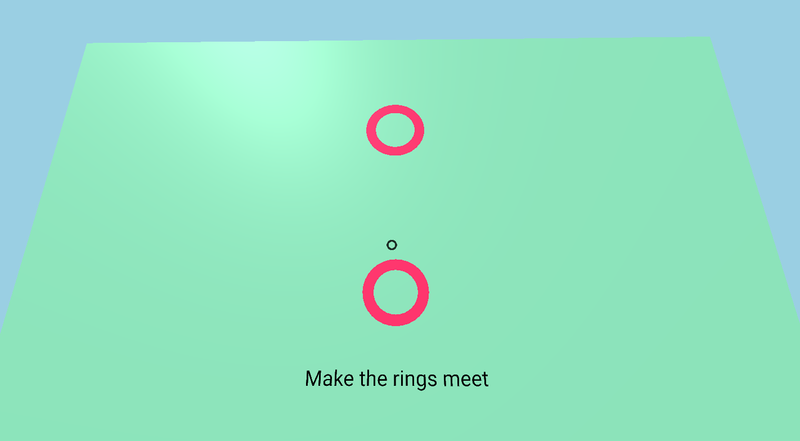 A game where you look at 2 rings to make them spin and have to time which rings to set off to get them to overlap. That version turned out pretty well. I combined some simple things I found from examples into my own project: a few different animations, a script that changes an object colour when hovered over and displaying text. I did have to get some help from Ada Rose Edwards writing a function to check the collision of the two rings because I couldn’t figuring out the syntax. Now that I had the basics down I could build from them. I wanted to flesh out the basic project I had. I wanted to make use of the 3D space VR provides, add in some cool simple graphics, more animations to make it more interesting and to make the gameplay needlessly harder. I used a-ocean to create the water, and used an image to create the sky effect, as a patterned background made it easier to know where you are facing. The ducks are just boxes that have been scaled which orbit around the smaller cubes, which produces a nice movement patterns. The signs are made up from two boxes, and the score is kept and updated through a function I wrote. The project and all the code for it is online, so feel free to try it out and build on top of it. If you want to try out WebVR, you should go for it, it’s not as scary as it first seems, you still have time to enter VRTogether, and if you get stuck you can join its slack and ask questions. Thanks to Diego González and Daniel Appelquist.